Another big gap opening on economic data. We’ll go long on the opening, as the eminis have pushed through a trend line of resistance and indicate we will get the backtest of the purple channel we’ve discussed. 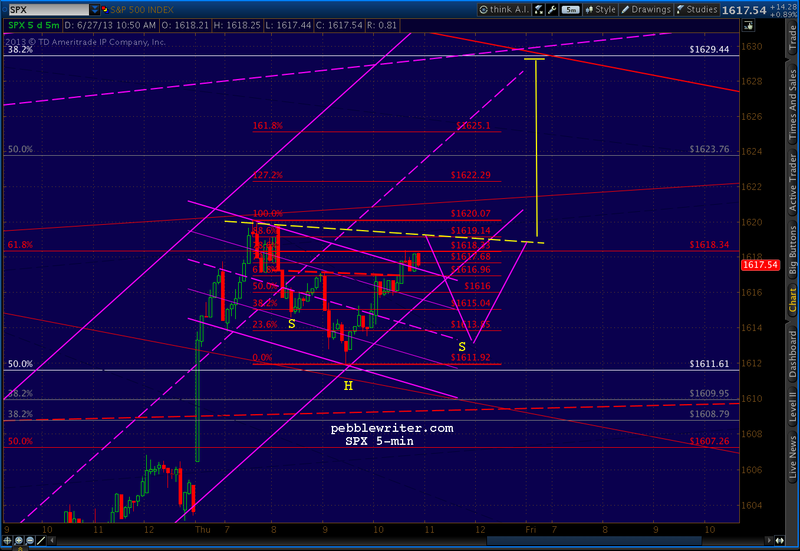 SPX just navigated the same TL (red, dashed) on the opening. 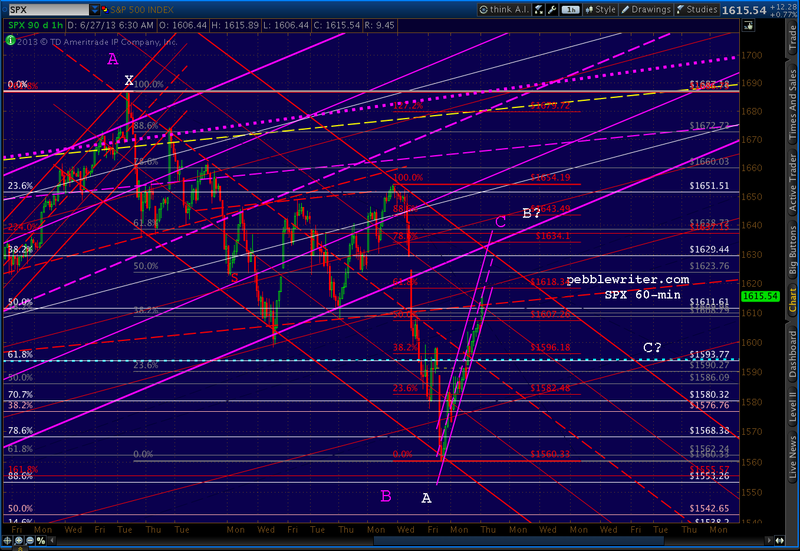 The keys this morning will be remaining above 1612.45 and pushing through the red .618 Fib at 1618.34. Cleaned up the SPX chart a little… We should get a backtest of the red channel .75 line and above-mentioned TL at 1618.34 — probably to 1611 or so if it’s able to remain in the purple acceleration channel. I think it’s worth a short position with tight stops. 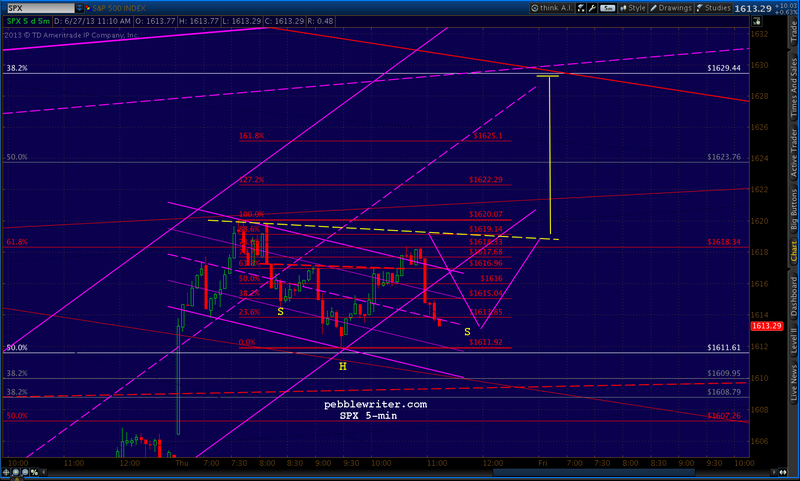 This one’s a little tricky, though, as it’s the .618 retrace of the drop from 1654. 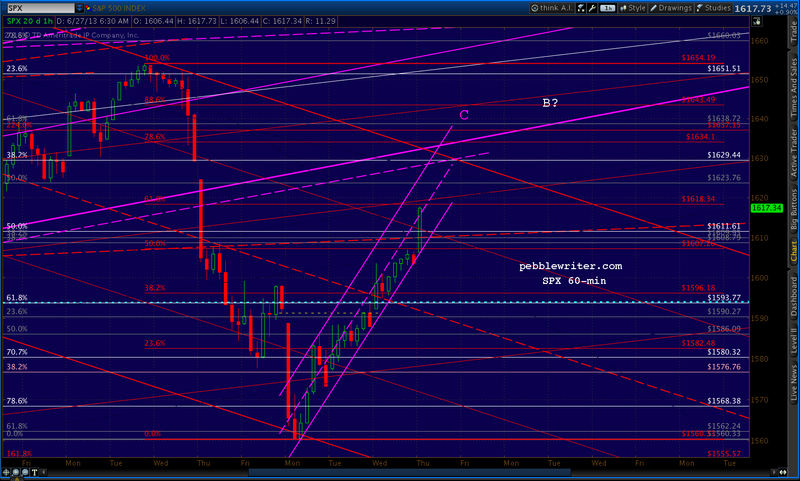 The next higher Fib based on 1687 is the grey .500 at 1623.76. The white .382 (1536-1687) at 16129.44 and the channel bottom itself at 1629-1632 are also in the mix. This might be as good as we’re going to get under the circumstances. 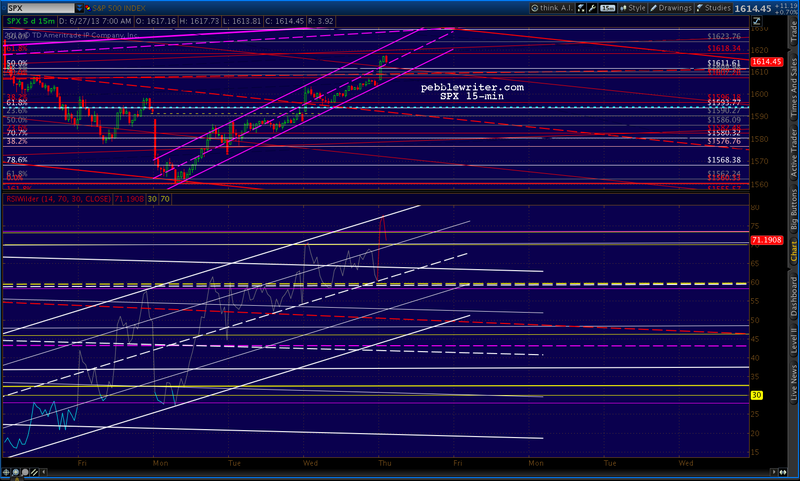 I’ll go full short here at 1617.34 with stops at 1620ish. But, check out the RSI charts… The daily, which is always subject to intra-day pushes beyond channel lines, does show potential stiff resistance from both the red TL and the .25 white channel line. 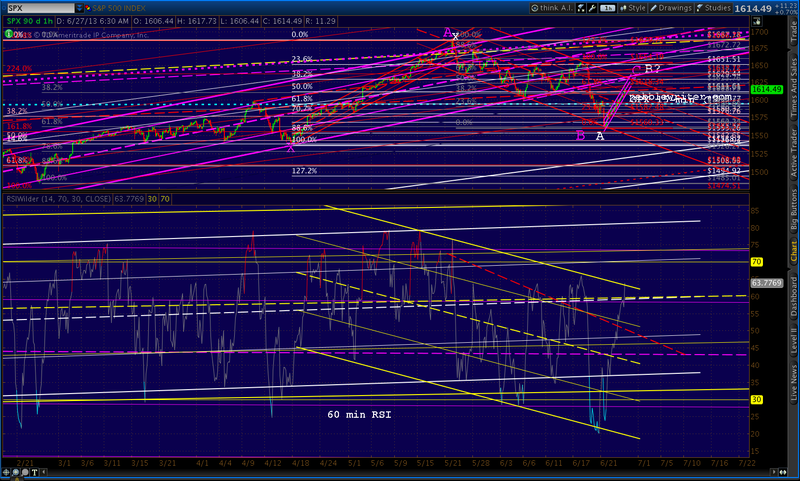 Even the 15-min RSI chart shows a turning point that could have some legs. This leads me back into the discussion of the bigger picture. We have a lot of noise today: pending home sales are the best in 6 years, income and spending are up, Dudley is speaking (but neither confirming nor denying), Lockhart’s coming up in a couple of hours, even Powell is getting into the act. All, including Kocherlakota yesterday, are pushing back on the notion that the punch will be watered down any time soon. And, all are shocked — shocked, I tell you! — that bond yields have risen as much as they have. I think instead of closing out the short here at 1620, I’ll take an interim long position on any strength through the .500 at 1623.76 — with the idea of riding it up to the channel bottom or gap close at 1629.22. 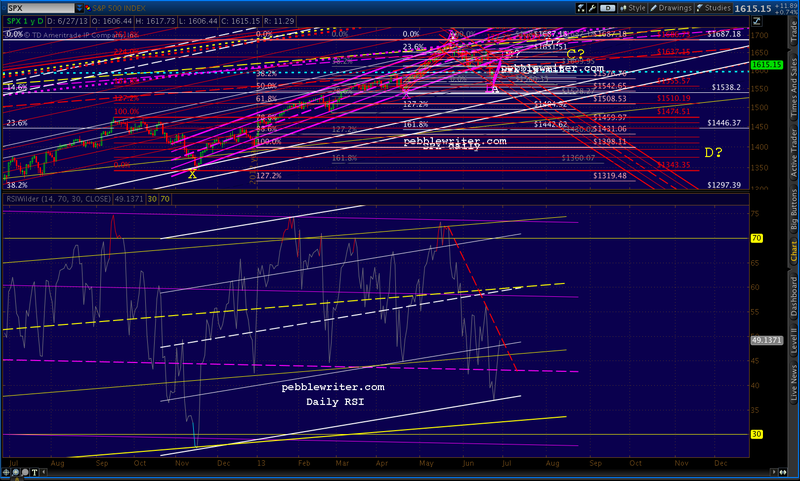 SPX just tagged the bottom of the channel at 1612. 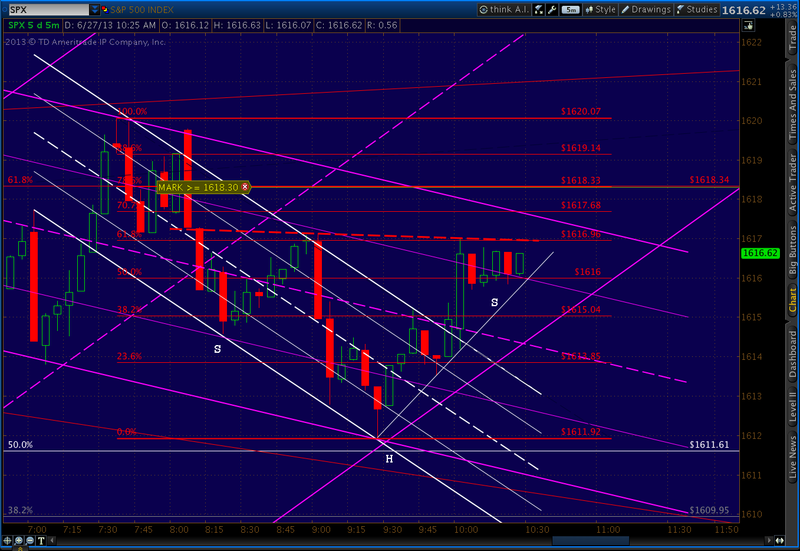 I’ll close the short here and revert back to a long position with stops at 1609ish. 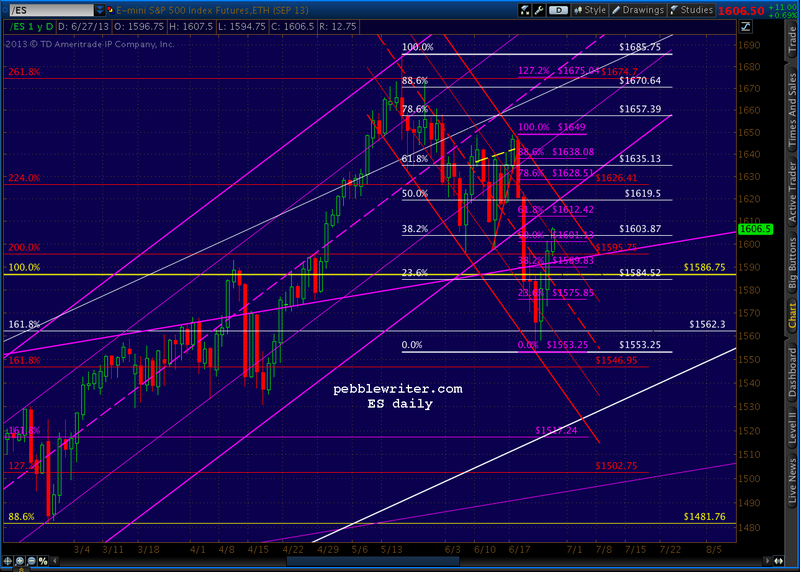 I believe it’s more likely to break the channel and go lower, but I’ll let the market decide. Why lower? The 15-min RSI chart suggests a back test of the intersecting yellow and purple channel lines (at the *) and then a bigger drop. 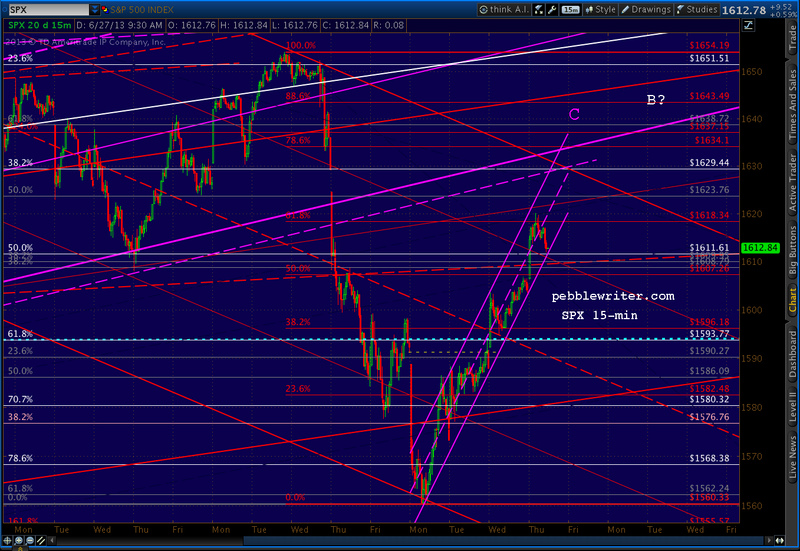 Maybe the red .500 at 1607.26? Looks like it might be the intersection of the bottom of the purple channel and the yellow midline — and .618 to .500 pullbacks are commonplace in a tightly managed mild-mannered market like this. But, hey, Fed Govs are out roaming the streets. Anything could happen. 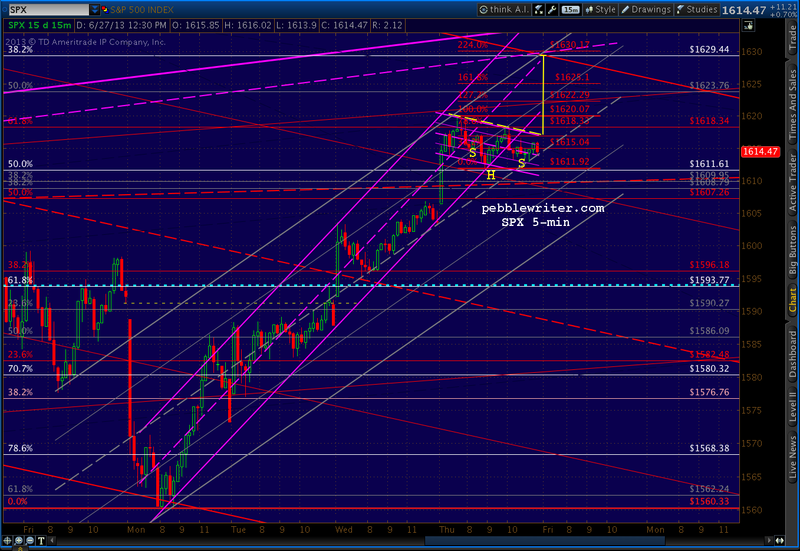 1615.25 ought to do it…next stop 1607? 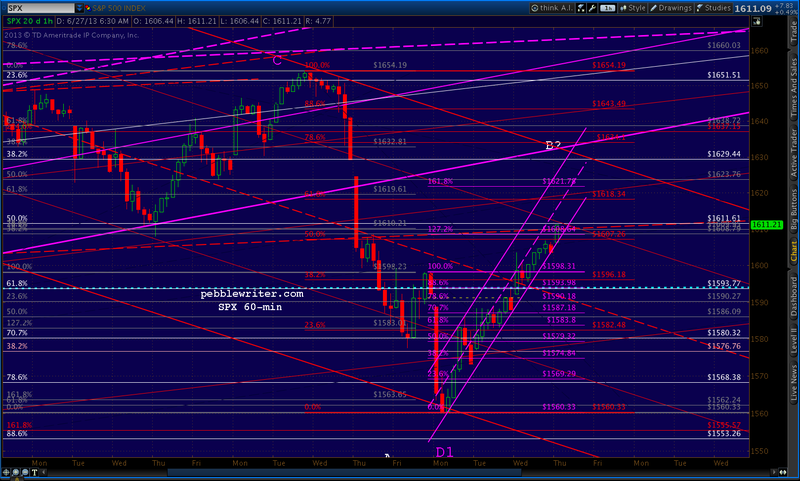 Next lower support would be 1596-1600. Full short again. Or, the sneaky version: run it up just past the top of the purple channel (clearing out the shorts), reverse at the .786 or .886 (get them back in) and zip back to tag the purple midline at 1613 (just below the rising channel bottom to clear out the longs, shorts double down.) Then back up to 1618+ to complete the IH&S — taking extra care to close on the neckline so no one knows what might happen overnight. Gap it in the morning to close the 1629 gap, then cut everyone off at the knees with a plunge to ??? 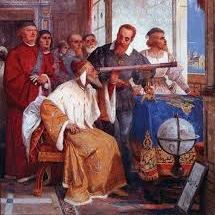 Having already been sucked into it, I’ll stick with the short position until it reverses down at the right shoulder (1612-16113) then go long again. That should just about do it pricewise. 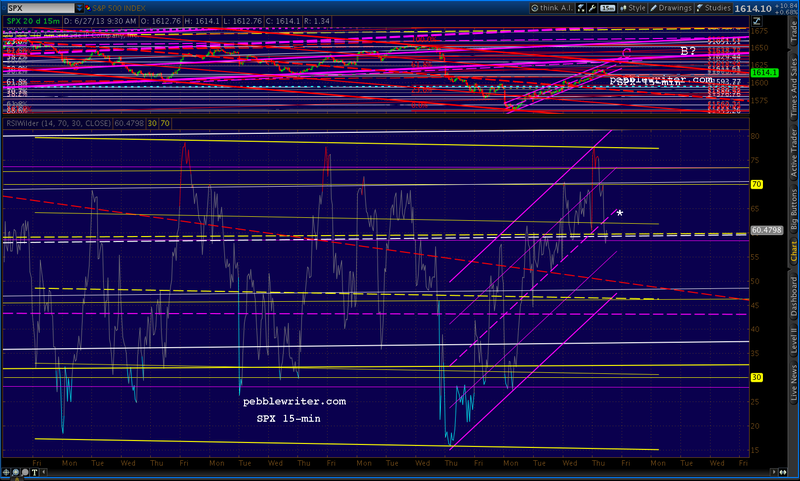 Long again here at 1613.29. Stops @ 1611ish. It’s a little early still if they’re going to close it on the neckline. So, possibly a little lower, or just a bunch of chop between here and 4PM. Cruising into the home stretch. For folks who, like me, watch channels, this are tough days. The original purple channel has been completely obliterated. Since it has broken down, it’s a sell signal, right? Not necessarily. Remember in Channel Tilting a few days ago we discussed how when one channel rolls over, another is usually there to take charge. Here’s the likely replacement for the purple channel, shown below in grey. We’re bound to dip below the midline once or twice before the close for good measure. And, there’s still a good possibility that the market tanks from here. The right shoulder of the IHS is looking rather elongated. A flag at 1608 would accomplish virtually the same thing — but more of it. Keep those stops where you’re comfortable. 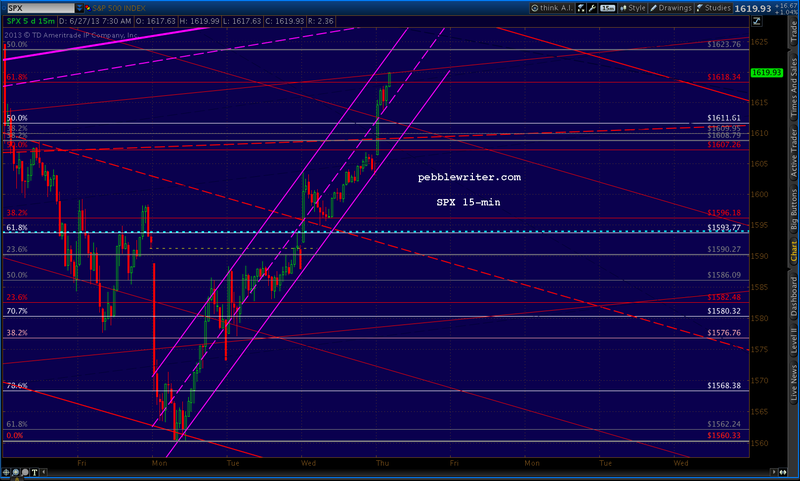 Suppose SPX goes up and tags the neckline at 1617ish at the close. Then what? 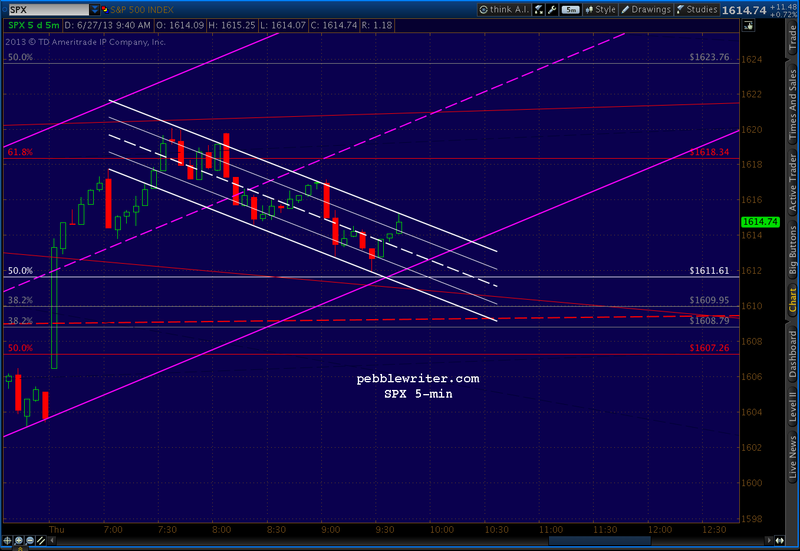 We talked about the purple channel tag and gap close up at 1629.22. Is that all there is to look forward to? I’ve been doing some charting today, and have come up with a reasonable scenario that differs a bit from our previous forecast.